The SB series CNC serpentine tube benders are designed for production use. All SB models tube benders provide for serpentine tube bending without the need to rotate the material between bends (R axis plane rotation). Program the bend angles, centerline radius, straight lengths, and serpentine production begins. The tubing always stays in contact with the support table maintaining flatness. One of the advantages of the SB series type tube bender is its ability to manage the serpentine coil as it is being formed. Because the bend head can bend both CW and then CCW without rotating the tube between bends, the ability to control larger serpentine coils becomes much easier. Winton offers several serpentine bending solutions ranging from 5mm OD capacity to 50mm OD capacity. All solutions make use of a 3 axis servo driven CNC system that allows a user to program all the angles and all straight lengths. The controller will compensate for spring back and provide a 3D model of the tube prior to bending, which assists in verification of part specs, while the rest of the bending process is CNC controlled. All models bend CW and CCW without the need to rotate the tube between bends. This feature often becomes important to ensure the bent serpentine tubing remains flat. 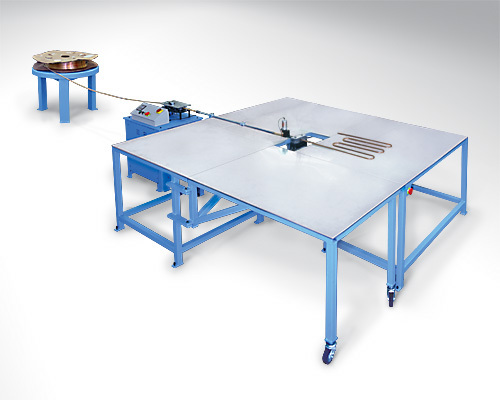 In heat transfer applications, a flat serpentine coil translates into an efficient product. A split die actuator comes standard and allows for tight radius bending. The design of the bend head allows for instant CW or CCW bending. Therefore, there is no need to reposition the bend head for the opposite hand rotation. This translates into process efficiency with the added bonus of eliminating the expense of a drop-away style clamp. All SB serpentine tube benders come standard with a tube straightener and a payoff to support a bulk spook of tubing. An optional cutoff provides for fast and accurate cutting of the tube after the serpentine profile has been formed. Winton also offers a serpentine bend head for its line of RD series CNC mandrel bending machines. An RD series bender with the serpentine bend head option installed allows for 3D bending.